I’ve moved on to summer treats before summer officially got here. Amazon.com had them for $63 with free shipping. That was the cheapest I found and it is worth every penny. Oh yes. Ben & Jerry’s Ice Cream Dessert Book. You do not need any other book for ice cream. Just this. I swear. 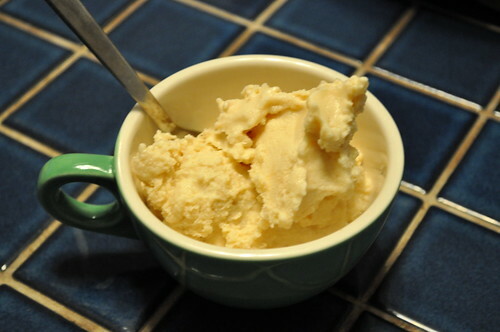 I made the Banana Peanut Butter Ice Cream on a whim while I had a day off and was growing restless (aka, I was in a car accent! all is fine but I did put my face on the bowl to help with swelling). I saw this recipe when I flipped through the first time and realized I HAD everything for the recipe. I looked no further in the book. Whisk eggs until light and fluffy, one or two minutes. Whisk in the sugar slowly, add the cream and milk. whisk until blended. Pour about a cup of the base in a separate bowl and mix in the peanut butter. Return the to the remaining cream base until completely combined. Pour the mixture into an ice cream maker and freeze following the instructions of your maker. Mash the bananas in a bowl with the lemon juice. Add the banana mixture to the ice cream when frozen with about two minutes left in the machine. This was a SIMPLE ice cream making experience. Perhaps too simple… I think Ben & Jerry’s really dumbed it down but I’m not complaining. It works 🙂 Oh, and the ice cream was YUMMY!!!!!! 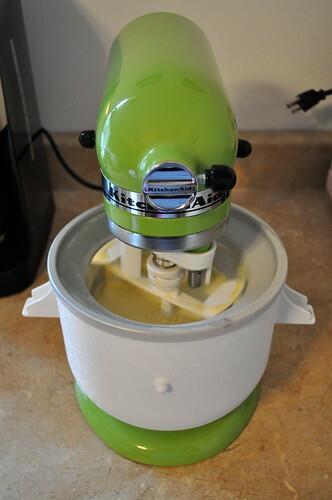 If you have a mixer I highly recommend getting the ice cream maker. It’s a lot of fun. this happens to me ALL the time. i buy bananas, i don’t eat them fast enough and they get ripe as ripe can be. i try to throw them in oatmeal but sometimes they’re a little too ripe for that. i always say i’ll make banana bread but then i miss that window of opportunity. 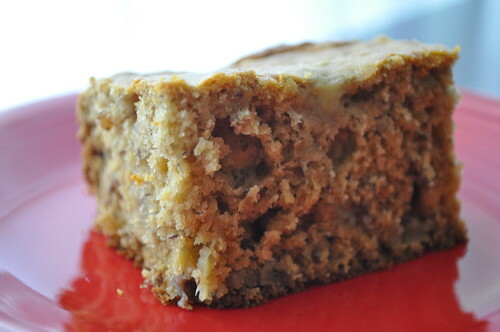 well this time i embraced that window and i made me some yummy banana bread. and it’s quite simple – you probably have everything you need and you don’t even know it! preheat oven to 350. lightly grease a 9×5 inch loaf pan. in a large bowl combine flour, baking soda and salt. in another bowl, cream the butter and brown sugar. stir in eggs and mashed bananas until blended. 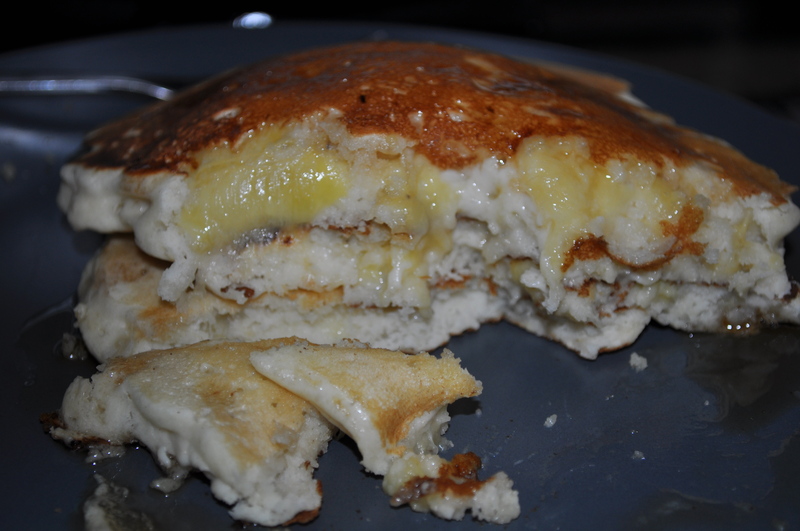 stir banana mixture into the flour mixture just until moistened. pour batter into the pan and bake for 55 minutes, or until a toothpick comes out clean. cool for 10 minutes and turn onto a wire rack to cool completely. i find this best served with a little butter. yummmyyyyy. and no more extremely ripe bananas in the garbage can!